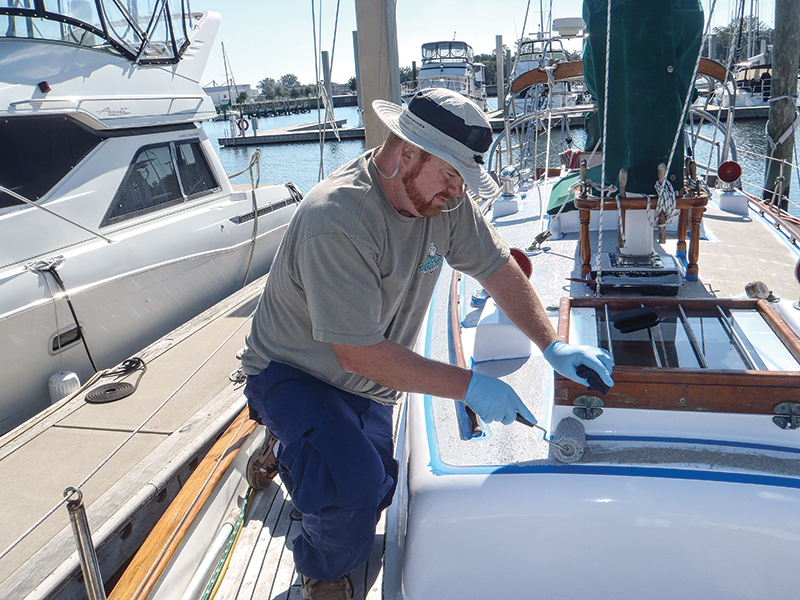 When it's time to update a boat's nonskid, there are renewal options. There’s nothing more hazardous than safety equipment that seems functional but in reality will fail when needed the most. A perfect example of this is a worn nonskid surface that provides adequate footing when dry but becomes dangerously slippery during wet or stormy conditions. Here’s a quick look at some popular nonskid renewal choices. 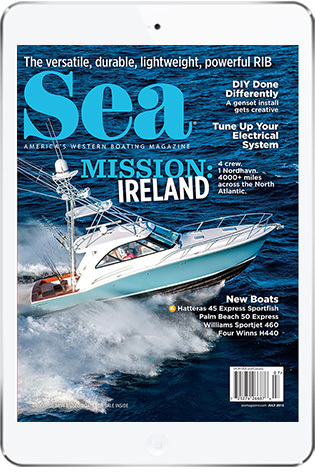 When the factory-molded nonskid surface of a typical fiberglass boat becomes worn, owners have a number of aftermarket options to choose from, each with pros and cons to weigh apart from their actual nonskid qualities. Considerations such as cost and durability are certainly important, but so too are factors such as ease of installation or cleaning when exposed to contaminants such as dirt or fish slime. The ultimate goal is a nonskid surface that not only meets these concerns but is also effective in extreme conditions while providing a good feel underfoot. Some deck paints use some form of “grit” or media to provide traction. Examples include anything from graded/sifted sand or crushed walnut shells to polymer beads. Larger, sharper grit produces the best traction but is also less friendly to bare feet or skin. Conversely, fine grit is less aggressive to skin but provides less traction. Other considerations include the use of one- or two-part paints — the former being cheaper, the latter being more durable — and color selection. Lighter colors are cooler but produce more glare and tend show dirt more readily. Depending on the product used, the grit itself can come premixed in nonskid paint or be sold as an additive for mixing into deck paint by the user prior to application. It can also be sprinkled onto wet deck paint, followed by additional coats of thinned paint, to provide the appropriate color. Products such as Durabak, Epifanes Nonskid Deck coating, Interlux Interdeck and Pettit EZ-Decks are all good examples of premixed nonskid paint. Modern nonskid additives include Awlgrip Griptex (a polymer bead aggregate that comes in fine, coarse, and extracoarse grades) and Epifanes Non-Skid Beads, a pre-measured polymer-bead compound sold for mixing with Epifanes polyurethane and monourethane paints. Textured deck paints get their traction from the raised patterns created by using a special roller sleeve during application. As the nonskid property is provided by the texture of the paint itself, rather than suspended grit or other filler media, there’s no worry about the paint wearing down over time and releasing the nonskid material. Nonskid mats and coverings are a popular choice due to their traction, stain resistance, low maintenance, and wide variety of colors and finishes (including faux teak). Their cushiony nature provides a modicum of shock absorption, which increases comfort underfoot, and noise reduction. Their ease of installation lets even the DIYer achieve a custom look, whether installing smaller self-trimmed mats or template-made kits that cover an entire deck. 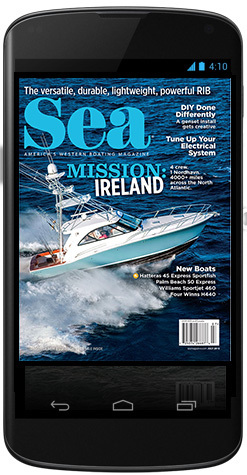 Popular examples include Treadmaster, SeaDek, and Esthec Nautical decking. Treadmaster and Esthec panels are glued in place using a manufacturer supplied, user-applied adhesive. 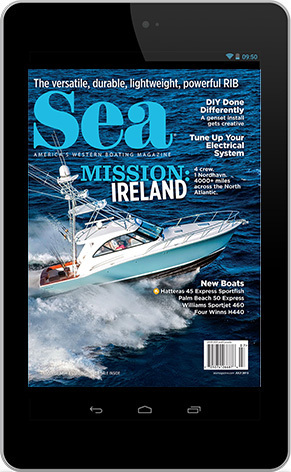 SeaDek utilizes marine-grade 3M pressure-sensitive adhesive backing, allowing users to simply peel and stick panels in place. 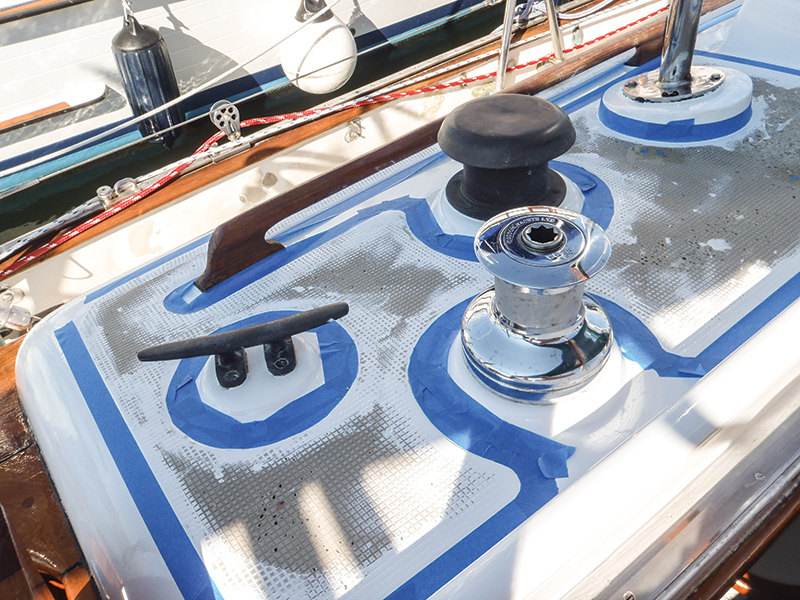 Cost-wise, nonskid mats and deck coverings will typically be more expensive than paint, but they also provide more customization with regard to design patterns and color options. While these will vary widely depending on which nonskid you choose, here are a couple of basic tips that can be applied to most any installation. Prep the surface per the manufacturer’s instructions. 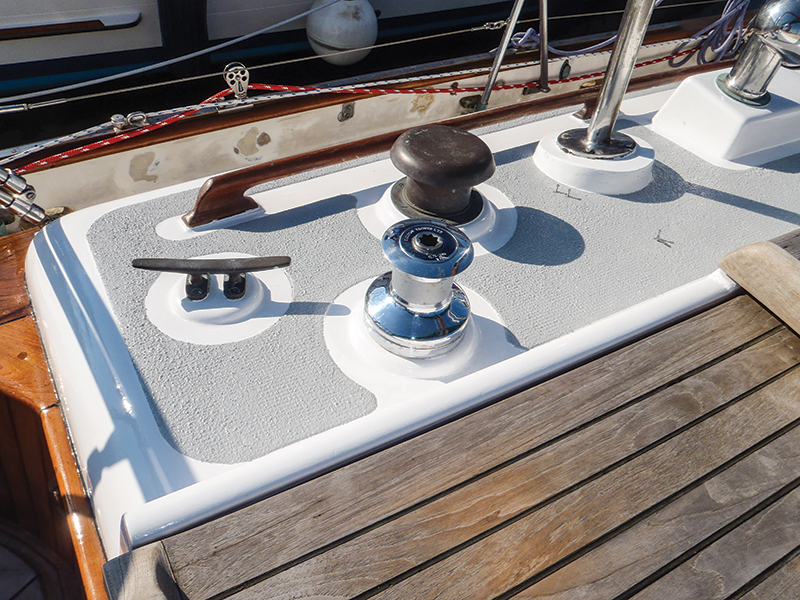 This will commonly involve washing the deck with a mild boat soap to remove dirt, grease and other contaminants. Allow it to dry, then sand with an orbital sander using 60-grit paper to both level the area and scuff the old surface. Finish with 120-grit sandpaper, vacuum up any dust, and wipe down the surface with a rag and 202 Fiberglass Solvent Wash. Replace the cloth as it picks up residue. With apologies to Robert Frost, careful masking (e.g., straight lines, curved corners) during a nonskid paint project will help give the finished project a professional look. For cleaner edges, allow paint to set up for about 30 minutes before you remove the masking tape. Don’t wait until it’s fully dry, however, as the tape will be more difficult to remove and may “tear” the paint.